Children who have experienced early trauma and loss find it difficult to trust. Through felt safety, we invite them to "step out of the boat" and try new things that may feel foreign or scary. By taking small steps and celebrating progress, our children build an "I can" mindset. Our goal of tearing down those hindering fears, is coupled with developing strong, healthy boundaries in personal relationships. We emphasize family connections first and encourage parent participation whenever possible for strengthening attachment. Just as Peter was strengthened as he kept his eyes on Jesus, we lead children to Christ. When Peter’s eyes were on the storm, instead of Jesus, he sank. Then Peter called to him, “Lord, if it’s really you, tell me to come to you, walking on the water.” 29 “Yes, come,” Jesus said. So Peter went over the side of the boat and walked on the water toward Jesus. 30 But when he saw the strong wind and the waves, he was terrified and began to sink. “Save me, Lord!” he shouted. 31 Jesus immediately reached out and grabbed him. WOW Kids and Grace Girls meet the 2nd and 4th Tuesday of the month at 6:30 p.m.
Look for dates to be announced in coming weeks. This is a nurture group for babies and toddlers from 0-5. It's a baby and me group, where we would ask that one parent will attend the group to help build attachment and trust with your little ones. We will have songs, story time, and attachment activities for parents and children. 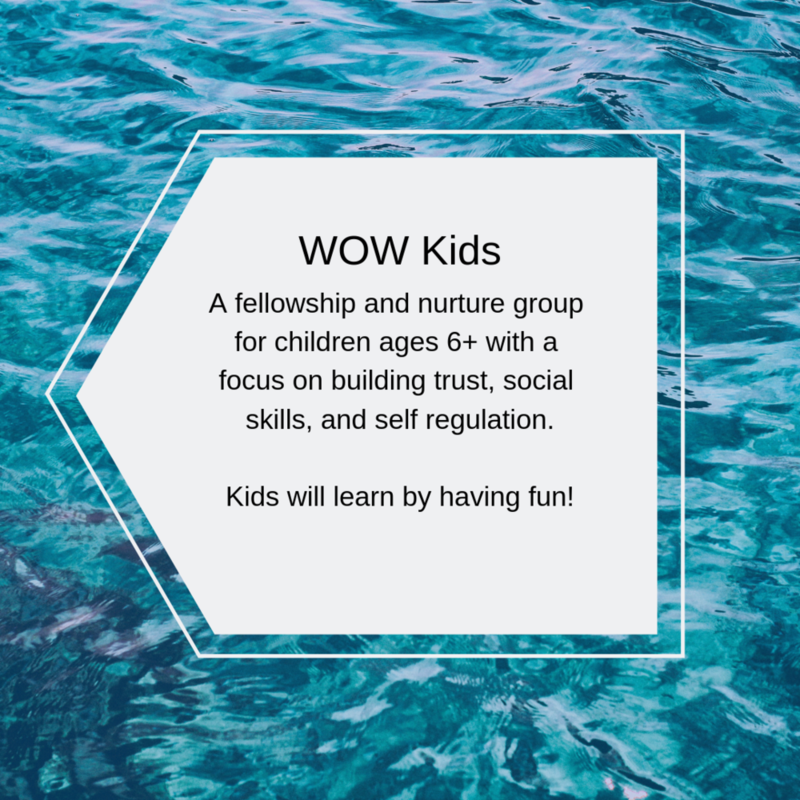 This is a fellowship and nurture group for children ages 6+, with a focus on building trust, social skills, and self regulation. We will cover multiple topics throughout each semester, and appreciate your commitment to 5-6 classes over 10-12 weeks, so that your child can connect with our facilitators and other classmates. A connect group for adopted teen girls ages 15 and older. This group provides opportunities for developing healthy friendships while playing, praying, and serving together. We will cover multiple topics throughout each session (group of dates). We would appreciate your commitment to the entire session. If you enter our office through the door behind this sign, you go down the stairs and into the first office on the right.